Bean Cash (Ticker: BEAN) is a re-brand of the digital currency and network, previously known as "BitBean" (Ticker: BITB). The "BitBean" blockchain and network began on February 13th., 2015. In 2018 a private company (unrelated to the crypto currency previously known as "BitBean") began using US Trademark authority to usurp the name "BitBean" for it's own use. Pre-empting this action, in late 2017, it was decided by Bean Core to rebrand to Bean Cash to avoid unecessary conflicts. It was the first 'crypto-currency' to implement a maximum of 20MB block sizes, based on Gavin Andersen's proposals to fix Bitcoin's scalability limitations. BitBean was also the first 'cryptocurrency' to pioneer the use of static block rewards in a Proof of Bean (PoB) system -- which now makes energy wasting PoW (Proof of Work) systems, inefficient, expensive and archaic! 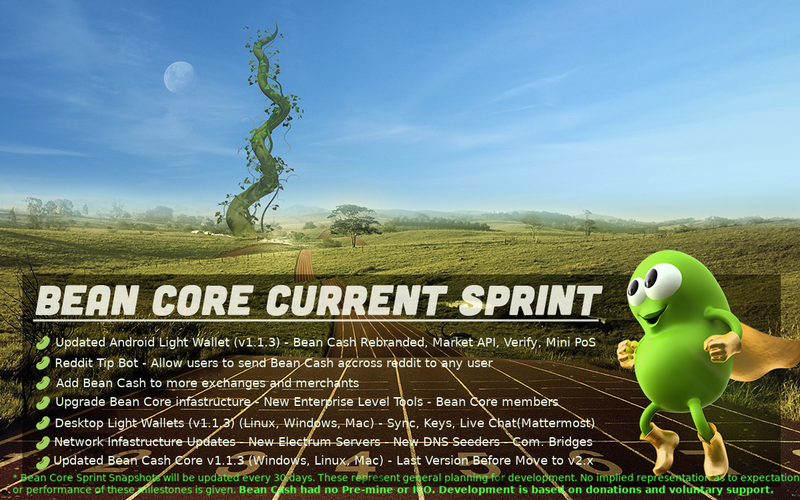 Bean Cash inherits BitBean's mature blockchain and rock-solid network, becoming one of the most super-green digital currencies on the market today! While other blockchains continue to hardfork, roll-back transactions, and change their protocol (Bitcoin Segwit), Bean Cash has never had a hardfork or transaction roll-back. Bean Cash (formerly known as "BitBean the Cryptocurrency") had no ICO, pre-mine or swap. Blockchain integrity is one of the defining features of Bean Cash. What Makes Bean Cash Different? Bigger & Faster - How Does That Benefit Me? Transactions on the Bean Cash Network are sent within 0-3 seconds! With a maximum block size of 20MB and a 60 second target block time, Bean Cash enables near real-time confirmation of transactions in blocks. A single confirmation can take as little as 20 seconds to become confirmed. Within a minute or less, Bean Cash verifies, validates and settles transactions in near real-time, something many other leading 'crypto currencies' fail to do in the same time period. With Bean Cash, merchants have zero counter-party risk and no charge-backs! This provides real value to the market, by improving on the charge-back prone, lengthy settlement times, and expensive fees associated with credit cards. Even compared to other cryptocurrencies, such as Bitcoin Segwit (BTC), where fees can range as high as $15-$30 USD or more per transaction! Bean Cash transactions can be as low as a fraction of a cent or .01 BEAN! An incentive is provided to consumers and merchants who hold BEAN and participate with the network, in a process called SPROUTING. SPROUTING is a process where transactions are verified, sent out on the network, and built into immutable blocks via a public ledger. By participating in SPROUTING and providing computing resources to the network, users can earn 1,000 BEANs or 1 SPROUT for each new block their node builds and signs. This provides an opportunity for users of the network to earn rewards from actively holding their BEANs. Currently the average return on BEANs is upwards of 3% per month (depending on current difficulty). For merchants, this provides greater value than simply selling their BEANs on the market, thus encouraging adoption. Merchants can then offer their SPROUTED BEAN to their loyal customers as a reward. This system, known as PoB (Proof-of-Bean) replaces PoW (Proof-of-Work), by securing the blockchain, using holdings of virtual beans instead of hash power. PoB provides the basis for a real proof-of-work system, since philosophically speaking, money is a a form of of proof-of-work in the past, and thus should be able to substitute proof-of-work all by itself. What Problem is Bean Cash Solving? In its mission to be a transaction-centric digital currency with real-world use, one of the main goals for Bean Cash, is to solve the "last mile" issue in the digital currency space. Instrumental in achieving this objective, will be to partner and work with companies that implement Bean Cash at the Point of Sale/Service. Bean Cash builds on the original Bitcoin protocol, which is turing complete and had the capability to handle 'Smart Contracts'. To realize this potential, Bean Core will be working to fix and re-enable the dormant Op-codes in its protocol. With the original Bitcoin Op-codes restored, along with new ones added, it will be possible to build a higher level language and environment on-top, allowing Bean Cash to reach a wider market of developers and adoption. In addition to PoB, Bean Core is actively developing a new technology, called Proof of Resource (POREs). This technology when fully developed, will allow Bean Cash Core nodes to earn additional BEANs by sharing more resources with the network. POREs is projected to be implemented as a second tier service on top of v2.X Core branch in early 2019. Bean Cash builds upon Satoshi's vision for a "Peer-to-Peer Electronic Cash System", as laid out in the Bitcoin whitepaper. When studying the history of Satoshi and Bitcoin, we can discover that it was always Satoshi's intention to lift the block size limit above 1MB in order to scale on-chain as needed -- to meet the demands of adoption. In keeping with Satoshi's vision, BitBean started nearly 3 years ago already with 20MB maximum block sizes. This is 20 times bigger than Bitcoin Segwit's (Ticker: BTC) maximum block size. Combined with a target block time of 60 seconds, Bean Cash is already positioned, to handle over 1,300 transactions per second, allowing it to compete with payment systems such as Paypal. Bean Core is no longer publishing RoadMaps. We are moving to an Agile software development model and will be publishing periodic Sprint Snapshots. We have deployed a new Project Management system and will be utilizing it starting in 2018 and moving forward into 2019. Team Bean is comprised of developers who have families with children. Reflective of this is a core value that family time is first. Bean Cash is the first digital currency with a developer philosophy that families come first. Our developers are committed to moving Bean Cash technologies forward and supporting its success for at least the next 93 years! Your patience in seeing new developments mature will be well worth the wait! Starting in July 2017, Bean Core's development schedule moved from part-time to full-time. Our development team currently consists of two full-time and 3 part-time developers. Bean Cash is currently being maintained and developed by Bean Core, a virtual world-wide company, comprised of volunteers who seek to be stewards of the core codebase, maintaining it and working to gain consensus within the community. Bean Core is not a legal fiction or a subsidiary of the Global Banking Cartel's vast array of corporate governments. Bean Core is an ad-hoc group of passionate and vested holders of Bean Cash from around the world. Bean Cash never had an ICO or pre-mine and depends on the good faith of its volunteers and donations from the community for development and marketing progress. Around the Core group is "Team Bean", which is comprised of over 1,000 holders of Bean Cash. If you have talent, skills or resources that would benefit moving Bean Cash forward, as it gains mass adoption around the world, please reach out and contact us! It is only working together that we can move Bean Cash forward into the future, giving the people of the world, real money that they own and control themselves! Contact a member of Team Bean, and learn how you can become Unbanked today!